To kick off the weekend I celebrated the eve of my birthday by enjoying a tasty delight for my taste buds: A fresh fruit strawberry-blueberry smoothie. Fresh fruit smoothie? Yes, please! 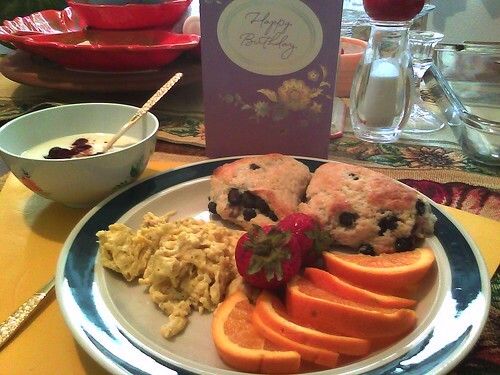 My birthday was as good as my breakfast looked. It was enhanced by other tasty food, lots of love and well wishes sent my way, and some family time. I am ending the night with a slice of birthday pie (homemade lemon meringue, mmm) and a good book. Tomorrow I hope to continue this week’s apparent theme of creative inspiration. I’m off to the opening day of the new Tim Burton art exhibit at LACMA. For LA locals, if you like Tim Burton or any of his works, then this is the art exhibit to see. This exhibit runs from tomorrow through Halloween. I’ve been to a few museums in the area but never to LACMA so this will be a first. For my US readers I hope you have an enjoyable long weekend and a Happy Memorial Day on Monday. Summer is just around the corner!